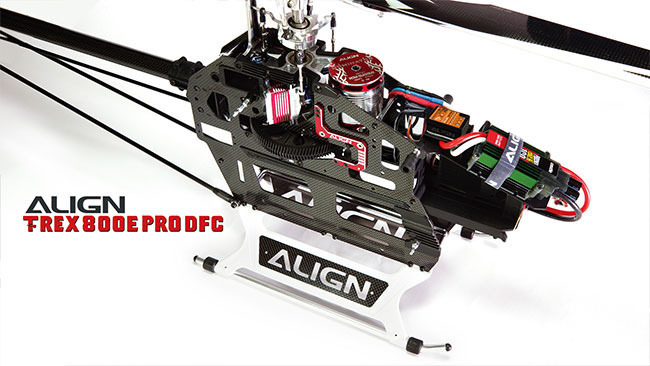 The T-REX 800E PRO DFC is an 800 class flagship designed specifically for 3D flights. 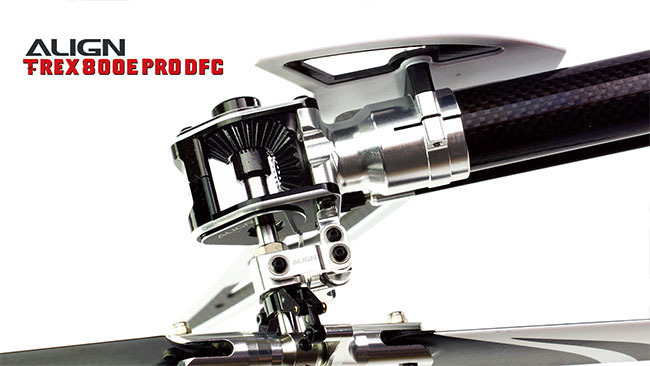 The CCPM direct connect servo design, coupled with DFC rotor head assembly, results in fast, precise, and more direct control reaction. 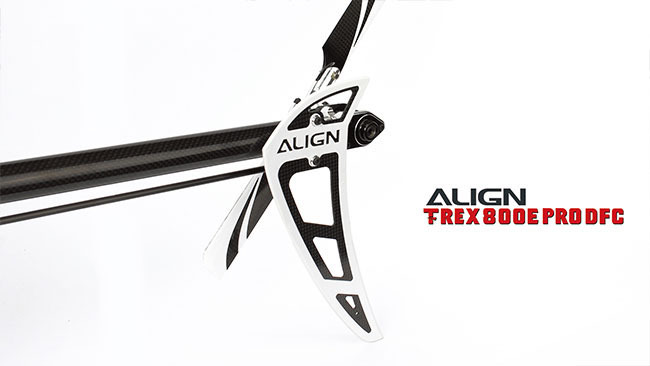 The frame material integration technology is utilized on the landing gears and vertical tail fin, creating a unique look not only making the T-REX 800E PRO DFC stand out, but also resulting in an innovative design that encompasses structure rigidity along with beautiful aesthetics. 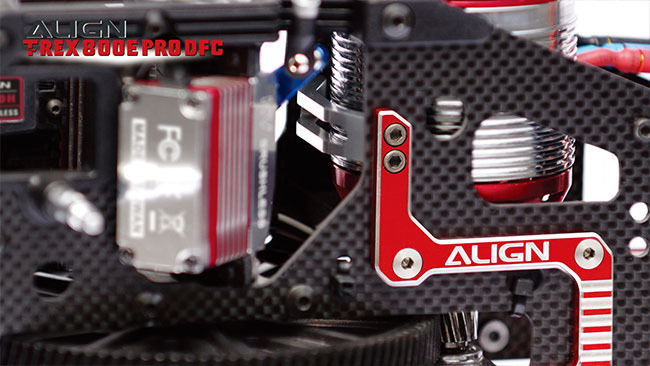 The new CNC machined aluminum cased BL815H brushless high voltage cyclic servos paired with BL855H rudder servo not only exhibited top of the line servo aesthetics, but also combine heat sink function and best performance in the market segment. 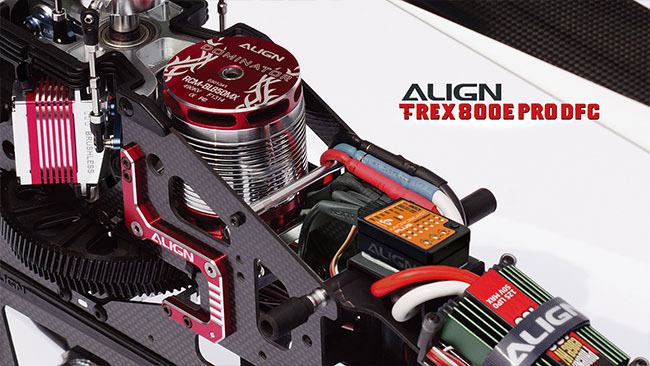 The T-REX 800E PRO DFC can be described as the current top of the line flagship representing Align′s superior product line. 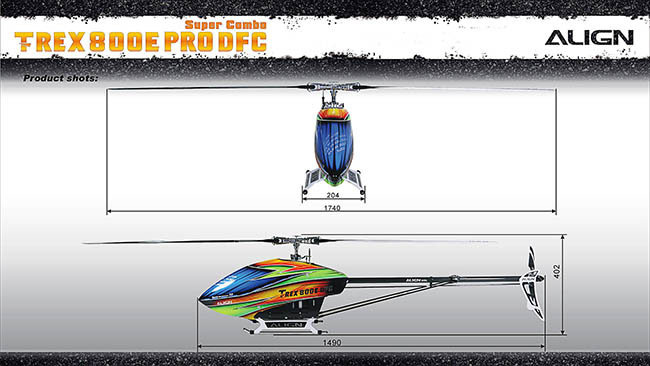 Based on the pedigree of pure 3D flight, the newest design concept with absolute top of the line equipment, along with superior aesthetics and attractive lines, the T-REX 800E PRO DFC will definitely elevate the adrenaline in your blood! 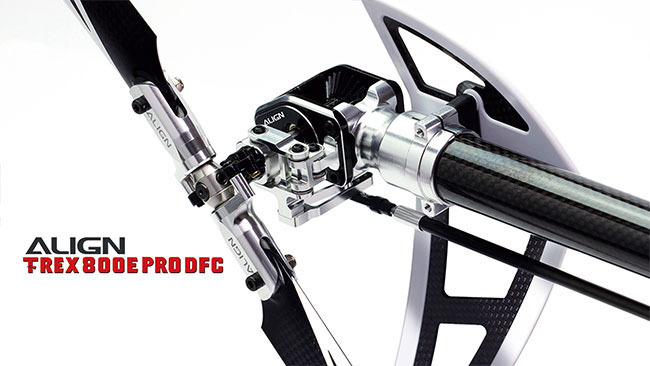 • Equipped with the low CG DFC rotor head, exhibits exhilarating 3D performance and unimaginable flight speed. • 850MX inherit from the previous 800MXs feature, high efficiency, superior power, excellent torque, low current draw and low temperature. It′s capable of maintaining much more consistent torque and head speed through continuous 3D maneuvers, which is particularly special design for 3D flights. • The high-end Microbeast PLUS 6-axis gyro with 32-bit high-speed processor is much precise and superior in programming and computing allow for significant handling performance and delicate response. In addition, the Microbeast PLUS gyro is vibration-reducing improvement and strongly reduce the effects of the vibration to flying performance. • New style swash anti-rotation guide with embedded anti-wear material, effectively minimize the wear between swashplate long ball and guide. • The shapely Reinforcement plate and brace are special design for T-REX 800E, effectively increase the torsional strength of main frame, under extreme 3D maneuver, you can strongly feel its solid reinforcement from its structure, thenew CNC machined aluminum electroplate red, is particular arranged in groups of 850MX motor, subtly bring the T-REX 800E PRO stylish and metal beauty. • Equipped with new high strength cnc M1 helical main gear and tail drive bevel gear assembly, featuring reinforced overall gear structure and increased gear thickness, effectively improves gear′s anti torsion ability to prevent gear from deforming under extreme power,reducing gear wear and power loss. 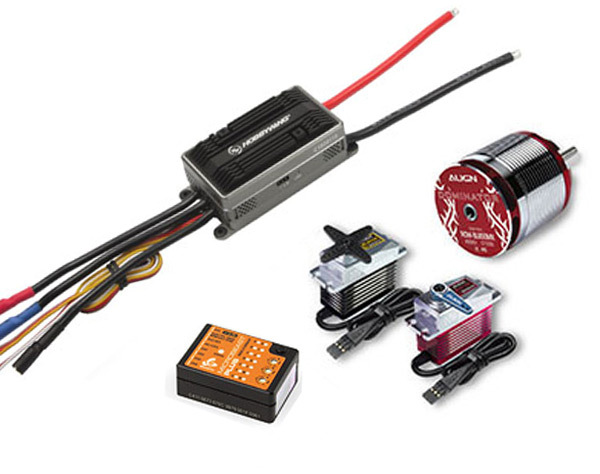 • The latest BL815H and BL855H metallic brushless servos are standard equipment, featuring superior torque, speed with unparalleled efficiency and precision. These servos are highly appraised by team pilots for their low operation heat, contributing to dramatically increased longevity. • Innovative composite of fiber material for landing gear, unique stylish shape, functional intensity and visual beauty are both innovative design. • Using competitive material and special imbedded technology for vertical tail, enhanced its structural strength and boutique texture efficiently, vivacious color providing excellent visibility.